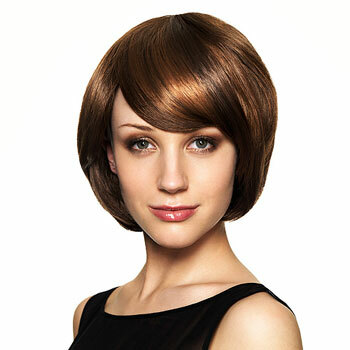 Made from 100% Premium Synthetic fibre with monofilament and soft net wig cap. The hair is made of premium high quality synthetic fibres that give the hair a soft, human hair touch and the beautiful, modern and professionally styled cuts are better maintained with curls that last longer. The cap is made of a breathable, thin fabric and is much more comfortable to wear without irritation or itchiness. Each strand of hair is attached one by one to achieve a luxurious, life like and long lasting. This wig is the most luxurious in synthetic wigs. Colour Shown:99J Cap Construction: Monofilament soft net cap medium size Length: 8"-10" Weight: 82g-84g Touch: Silky and Soft Style: Short, straight bob with fringe. For Colour Chart Please Click Here.